Jo Brand is a bloody legend. And it's not just because of her impressive comedy skills, feminist politics or the fact that she hosts Great British Bake Off's An Extra Slice (which you've gotta admit is a big plus though). She has got style. Her signature head scarfs inspire me to whip mine out of the cupboard and attempt to pull of said look for the 30th time every time I see her on my telly screen, and her ever changing hair colour reminds us that pink hair will always be cool. 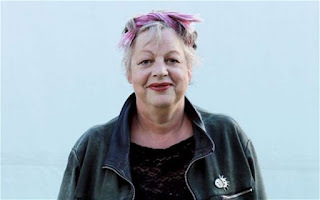 But possibly the most stylish thing about Jo Brand is how apparent she makes it that she dresses to please nobody but herself, which is exactly the way it should be. Here's to always channelling our inner Jo Brand, bringing our head scarfs out of the cupboard, and never dressing for boys!